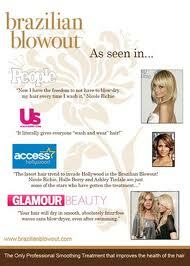 Brazilian Blowout is proved safe for consumer and stylists. LOS ANGELES, CA–(Marketwire – November 10, 2010) – On October 29, 2010, Oregon OSHA released results of a comprehensive air monitoring study conducted across seven salons. Each case yielded Formaldehyde exposure levels well beneath OSHA’s Action Level, Permissible Exposure Level, and Short-Term Exposure Level. OSHA’s Action Level of 0.5 parts per million is the most stringent level of exposure set by the Federal Occupational Safety and Health Administration. The average Formaldehyde gas exposure level for the seven salons tested by Oregon OSHA was 0.079 parts per million; over six times lower than the OSHA Action Level of 0.5 parts per million. Case 7: The seventh salon had four stations with a false ceiling. No doors or windows were left open and the stylist did not use any fans during the treatment. She did not wear gloves. Breathing zone samples were placed on the stylist during the process, which took 94 minutes. The samples were changed every 15 minutes. Samples were also placed to the right of the stylist, near the stylist’s sink and to the left of the stylist. The stylist’s peak exposure was 0.471 ppm, while applying the solution. Her average exposure during the procedure was 0.255 ppm and the 8 hour average was 0.050 ppm. The results did not exceed the 8-hour limit and it is unlikely that multiple treatments would have done so. CONCLUSION: Air sample tests conducted by Oregon OSHA demonstrate that Formaldehyde exposure levels are safely below OSHA’s Action Level. LOS ANGELES, CA — November 9, 2010) – The following statements are attributed to Brazilian Blowout — Last week, Brazilian Blowout (www.brazilianblowout.com) formally initiated legal proceedings in response to the Oregon Department of Consumer and Business Services, Occupational Safety and Health Division’s (Oregon OSHA) inaccurate and unsupported conduct. Brazilian Blowout intends to seek an award of punitive damages to dissuade Oregon OSHA (OR-OSHA) from acting so recklessly again in the future. It is the company’s intent to distribute all awarded proceeds to the salons and stylists who have supported Brazilian Blowout in the face of this adversity. Flaws were immediately found in the testing methods first used by Oregon OSHA. Upon this first set of tests conducted by OR-OSHA, the organization issued an alert to Oregon hair salons about Brazilian Blowout’s products. Test results publicized in OR-OSHA’s release of Oct 08, 2010 are inaccurate. OR-OSHA claimed to have found levels of Formaldehyde in Brazilian Blowout Professional Solution in “upwards of 10 percent or more in some samples.” OR-OSHA and its officials failed to distinguish between Formaldehyde and Methylene Glycol and published the percentage as Formaldehyde only. The only method that accurately measures Formaldehyde in water based cosmetic products is called “13C-NMR,” and OR-OSHA did not conduct this correct type of testing. Had OSHA performed this test, they would have discovered that only traces of Formaldehyde are detected, in this case .0011%. On Oct 29th, OR-OSHA released results of a comprehensive air monitoring study conducted across seven salons, each case yielded exposure levels that are safely below OSHA’s Action Level, Permissible Exposure Limit (PEL), and Short Term Exposure Limit.